Buying the dip was a good idea! Buying the dip was a good idea, broad rallies across the board. Let’s see if this holds up! During the last hour of the norma trading session, Bitcoin rallied from $6520 to just shy of 6800. Bitcoin smashed through the near-term Fibonacci levels of 0.618 and 0.786 before finding some near-term resistance against the 0.882 Fibonacci level at 6750. The moves come as a technical rejection of many repeated attempts by bears to move price into a position of creating a long- and short-term head and shoulders pattern. Litecoin, a clear laggard in price action when related to its peers on Coinbase, has experienced a significant drive higher, leading most of the ‘altcoin’ market on a broad rally. Litecoin has gained up to 15.74% on the day, with the current intraday trading showing the move could extend even higher. The move that Litecoin has faced comes from increasing bullish news that institutional interest and accumulation into Litecoin has continued. The move is also important because it shows the strongest attempt to break out of a consolidation zone that has been traded in since August 10th, 2018. Price has been oscillating above and below the 56-value area, which is the extremely important 1/8th Major Harmonic value zone – the final major support for Litecoin between 56 and one dollar. The move also comes as Litecoin is transitioning into a brand-new Law of Vibration time cycle. It is common for prices to see powerful trend reversals when they move into a new Law of Vibration cycle. Traders with short positions in Ethereum and Ripple have been significant, especially in the month of September. However, those positions have changed during this week. Today, the short positions for Ethereum have suffered a 3% drop. Ripple short positions for the day have been absolutely destroyed through the trading day, showing a -12.70% drop that looks to continue into the evening. Bitcoin shorts, curiously, continue to show an equal to greater growth as Bitcoin and the broader cryptocurrency market has grown. 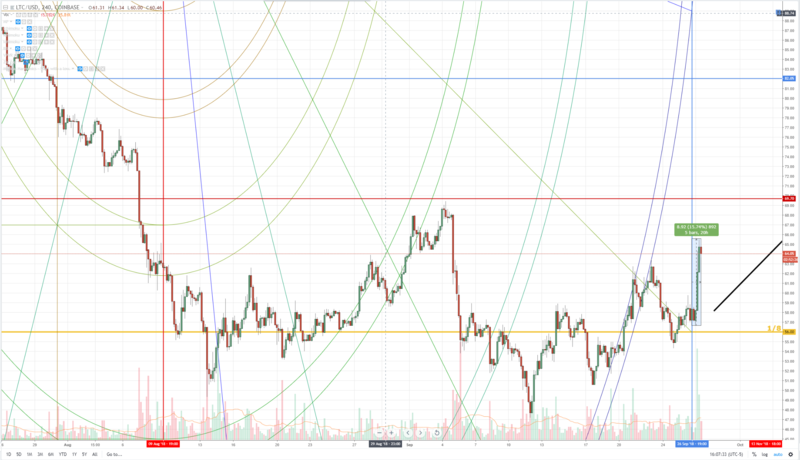 When analyzing the charts for both Bitcoin, Ethereum and other major altcoin markets, we see many shared patterns being broken: bullish pennants, bullish flags, long and short-term trendlines broken to the upside, key Fibonacci resistance levels are broken to the upside, massive volume returns and key geometric angles broke. More importantly, however, is the current season and cycle that cryptocurrencies are entering. The Fall season is a typically bullish season or relatively flat and accumulative season, after the Fall, the first part of Winter shows the beginnings of a strong, but a short bull market.